What is life without great friends? 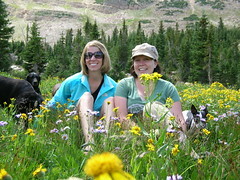 Spent Saturday hiking the Uintahs with my friends Julie & Becca. This was our attempt at capturing the coolness of this wildflower meadow. Great smiles girls! I love your blogs – about our time at the Uintahs and also the others that I caught up on. Your photos are AWESOME! I stole some of them to add to my collection that I took that day. It was so much fun and I can’t wait to do it again. Love ya!